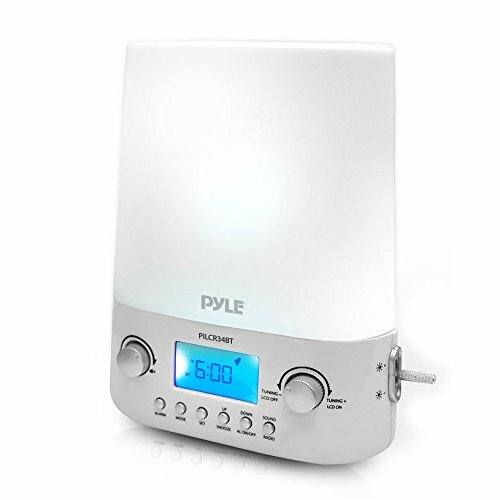 The Pyle Therapy Sound Machine will fill your bedroom with relaxing nature sounds — along with Bluetooth wireless streaming music. This multi-function speaker system combines an alarm clock, radio and night light — all in one. Feel at ease and get a good night’s rest when you activate the comforting & soothing sounds. The system features (10) selectable therapeutic continuously looping nature sounds. Built-in wireless Bluetooth ability allows you to connect your device and enjoy hassle-free music streaming. Connection is simple and it works with all of your favorite devices (like iPhones, Androids, Smartphones, Tablets, Laptops, etc.). Another unique feature includes the illuminating and self-adjusting LED lights. Choose from two selectable modes, Sunrise & Sunset, that allow the lights to imitate the hours in the day, and automatically brighten & dim. Use it as a night light in the little one’s room or just use it for deep sleep & relaxation.